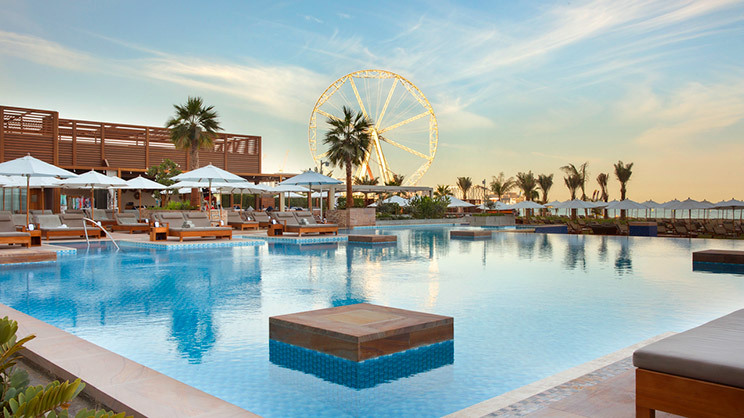 For a luxurious urban beach retreat at the heart of designer Dubai, look no further than the Rixos Premium Hotel. This architectural landmark sparkles high into the sky, with a stunning crystalline design that boasts an ideal waterside location. Featuring a pristine private beach, and an excellent list of water sports; families, friends and couples will have fun in the sun at this resort. If you’re looking to relax, the Spa offers a divine menu of healing treatments with a Turkish twist, along with a traditional hammam. 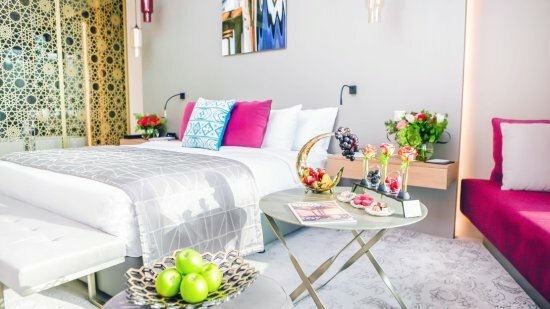 The elegantly decorated rooms and suites offer all the additional luxuries you can expect with the lavish Dubai lifestyle. Not to mention the outstanding views. 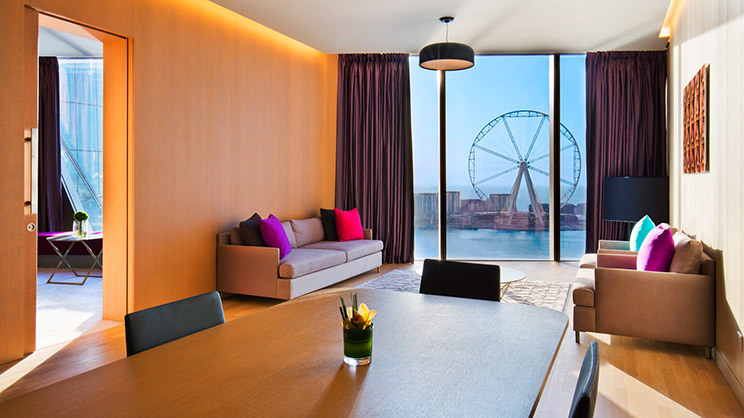 Depending where your room is, you could wake up to the azure waters of the Arabian Gulf, or to the dazzling city skyline. When it’s time to eat, there’s an eclectic mix of delectable dining options available at Rixos Premium Dubai. Go on a gastronomic journey from the Mediterranean to New York City, and wash it all down with happy hour drinks at the live music venue. 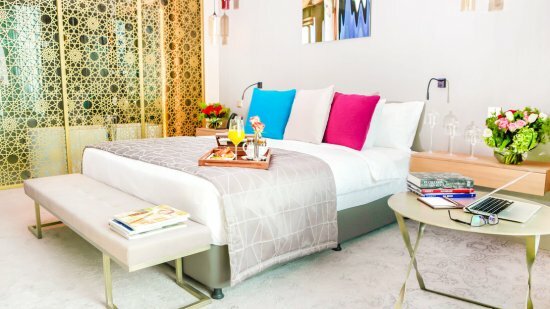 To join the rich, famous, and high society Emiratis living the glittering Dubai dream, book an unforgettable 5-star holiday to this cosmopolitan oasis today. This luxurious 5-star hotel features a private beach area for you to enjoy during your stay. Rixos Premium Hotel is perfectly situated on The Walk in Dubai, giving easy access to a wealth of attractions. There’s boutique shopping, cafes, restaurants and water sports right on your doorstep. The Palm Jumeirah is 15 minutes’ drive away, and the Burj Khalifa and Dubai Mall is approximately 25 minutes. For some fun family days-out, Legoland and the IMG Worlds of Adventure are an easy 30-minute drive. Dubai International Airport is approximately 40 minutes’ drive from Rixos Premium Hotel. 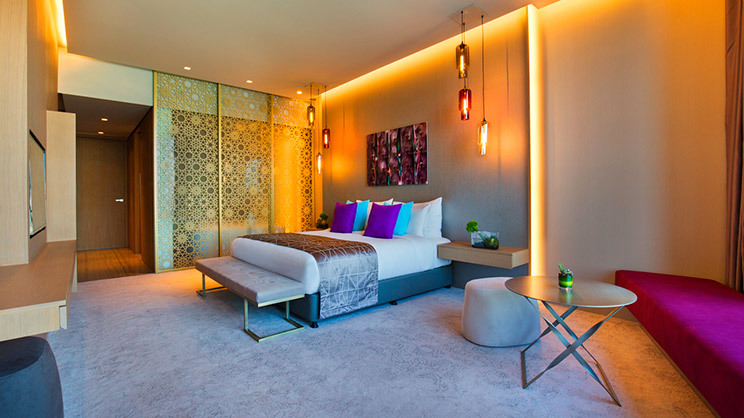 Click here for a virtual tour of the Rixos Premium Dubai’s Standard Room. As the name suggests, these suites are situated on the corners of each floor of the building. Featuring a lounge area that's perfect for relaxing with a freshly made cup of coffee, you'll have ample space available to live in comfort. 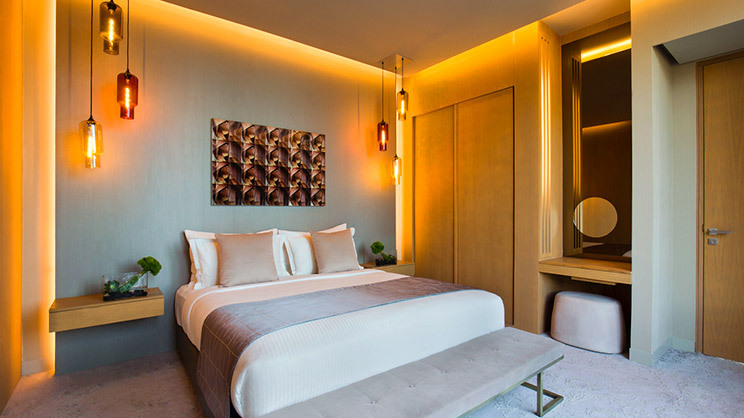 There's a spacious bedroom with a double bed, and the en-suite bathroom includes a bathtub, shower and luxury toiletries. 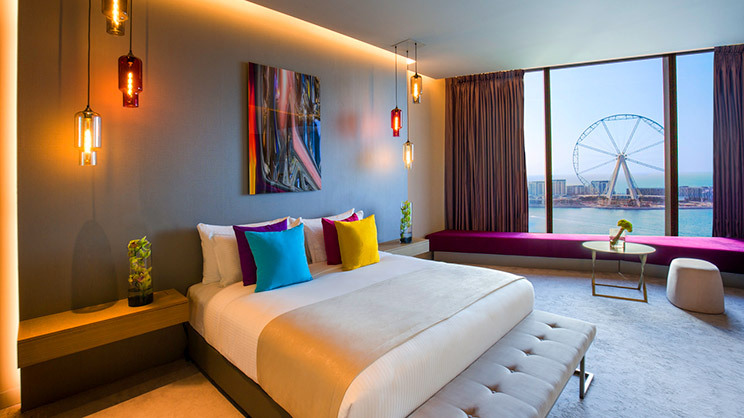 Both the bedroom and lounge enjoy picturesque views of the famous city skyline. 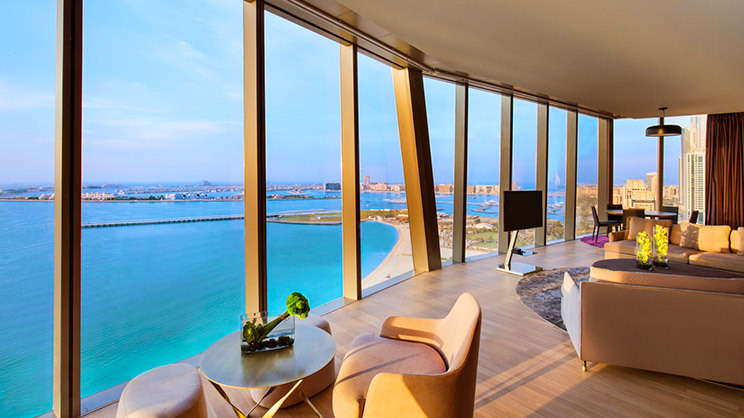 Click here for a virtual tour of the Rixos Premium Dubai’s Corner Suite. 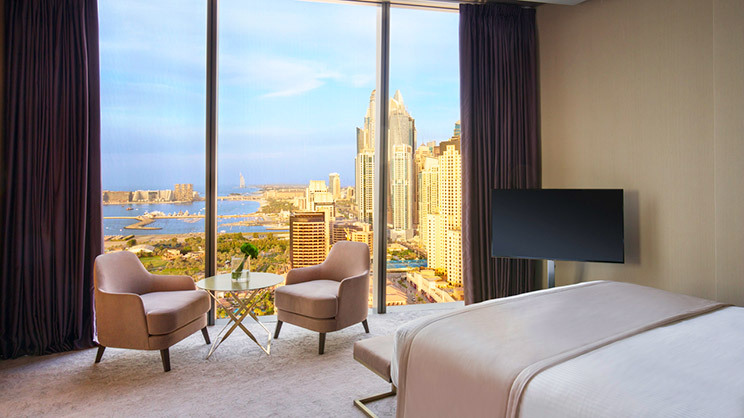 Relax in style during your stay at the Rixos Premium Dubai, in one of the hotel’s Premium Corner Suites. 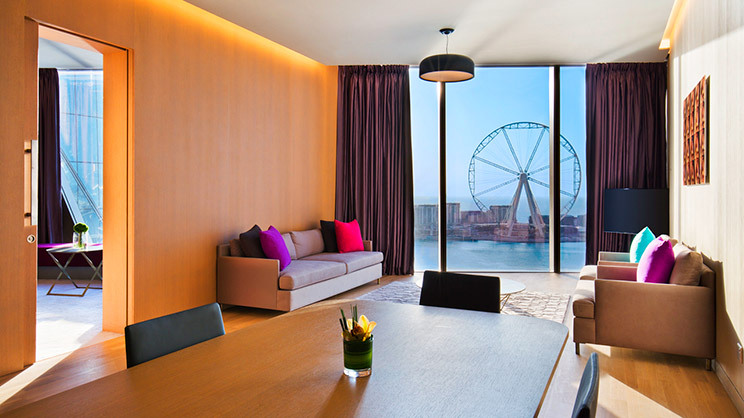 Here you can recharge your batteries in lavish surroundings while gazing out across the iconic skyline from the impressive floor-to-ceiling windows. 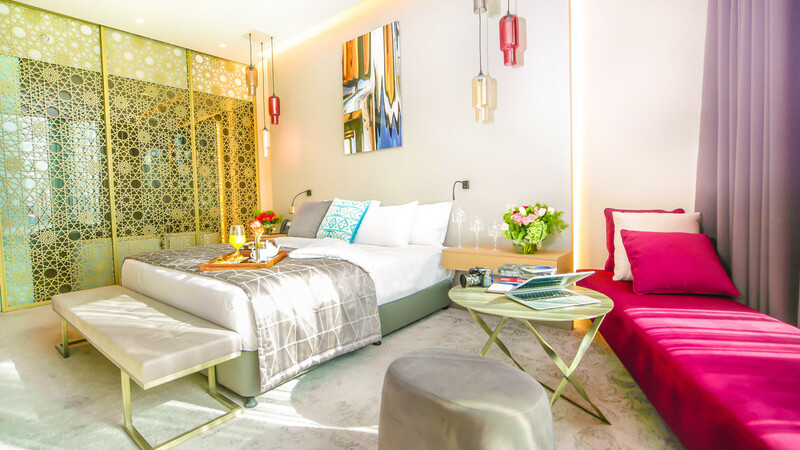 With plenty of living space, a modern en suite bathroom and an impressive entertainment system on offer, you will find all the modern comforts you could possibly need in these fabulous suites. Whenever you’re feeling peckish, this all-day dining restaurant will be there to satisfy your appetite. Dine in a relaxed atmosphere, that welcomes families, couples and friends for every meal. The menu at Turquoise Restaurant offers a mix of authentic Turkish specialities, with international cuisines that are popular around the world. Tuck into a succulent steak, at this chic, contemporary restaurant that combines a fine dining ambience with scrumptious steakhouse cuisines. If you’re a meat-lover, this is one not to miss during your holiday in Dubai. The first of the well-known Black Tap brand to open in the Middle East, this trendy burger bar is the perfect spot to get a taste of the classic New York scene. A selection of mouth-watering burgers are served with freshly prepared shakes, in true diner-style. Delicious at the end of a day of Dubai adventures. If you fancy an exquisite Mediterranean bite to eat, look no further than the Riviera Beach Grill. The menu here is filled with delightful summer favourites made with fresh produce, and served in a bright and friendly atmosphere. For the finest Italian cuisine during your stay, try this award-winning restaurant that aims for an authentic dining experience. The irresistible pizzas have been called “The Best Pizza in Town”, so are a must for lovers of sizzling cheese! Featuring live music, sports and a daily happy hour, this evening venue has a lively party vibe. There’s a fantastic menu of tasty comfort food to gobble down, that will perfectly line your stomach for a night out. The Rixos Premium Dubai hosts a ladies’ night every Tuesday, at the Inner City Zoo, where female guests can enjoy 3 complimentary drinks from 11pm to 1am. The Lock, Stock and Barrel also hosts a ladies’ night every Tuesday, with female guests able to enjoy 3 complimentary drinks from 6pm to 1am.